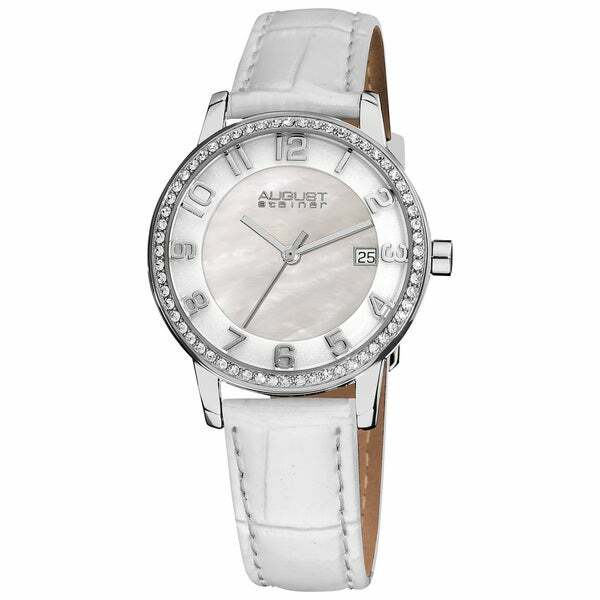 Add a touch of class to your wardrobe with this August Steiner ladies watch. The crystal design of this timepiece provides an air of elegance. The Swiss quartz movement with a date display ensures that you are always on time. Spotted one of the white band, white faced Swiss Army watches, but prices not in my budget! Clicked around website to find similar watches with white bands, mother of pearl faces. Found quite a few that were very similar to the Swiss Army versions, but face size of 38-41cm was a bit larger than wanted. This August Steiner with the 34/35 cm face is perfect. Fits my average to large wrist with the 8 1/2inch band. Band not high dollar quality, but thinness means not bulky. Mother of pearl face is beautiful for summer months, bling dial not to showy, numbers easy to read, keeping good time so far. Love that it is much lighter on wrist than my white resin bracelet watch. Hope clear stones around face hold up. At first glace this watch looked OK but after careful examination I noticed the numbers were painted with silver over raised plastic numbers which made this watch look very cheap. I think this watch was a knock off of some expensive watch. I had to send it back for a refund. I received the watch within 3 days after placing order. Packaging was beautiful. The only think I had to do was set it and put it on. I love the watch!!! To look at this watch it is beautiful, however it did not work, and I had to return it for that reason. "I love this watch but want a stainless steel link band, does anyone know if this company makes bands that can be interchanged?" We can only replace it with the same as the original band.